Conventional radio-tags are of great use for the study of sedentary birds or in short term projects. However, for migratory or nomadic species the range of transmitter is not sufficient. In cases where birds can quickly move over large distances and pass through inaccessible regions, only by satellite tracking can we acquire the necessary data. Satellite monitoring of bird movements is based on the Doppler principle. The worldwide Argos CLS system is a unique application of this method. NOAA satellites on polar orbits constantly scan the earth. During passes they identify and record short messages transmitted by Argos certified transmitters (abr. PTT). From very small differences of transmitted frequency (401.65 MHz) the Argos processing center can calculate geographical coordinates of PTTs. This system is commonly used in meteorology, oceanography, for monitoring the location of transport vehicles and other commercial applications. Thanks to the latest advances in microelectronics, satellite transmitters can be very small weighing as little as 20g. The majority of their mass is attributed to the battery. Energy is a limiting factor. Small transmitters either work a shorter period of time or they can be programmed to work intermittently, covering about one year but long gaps between activity periods thus limiting data collection. There is thus a compromise between the wishes of researchers and the technological limits tha currently exist. Small PTTs work on the technical limit of the system and sometimes are swamped by the transmission of more powerful PTTs. In order to save battery energy for longer activity, all these ultra-light PTTs transmit only for a few hours each week. This extends the effective life of the transmitter over one year. Development over the last few years, solar-powered PTTs seems to be the ideal transmitter for long-term study of survival and year round movements of larger birds such as the Houbara Bustard. The lightest version weights 35g and is supposed to work continuously for a minimum of three years, although this significantly increases the cost of satellite service. In 1998 we used four satellite transmitters, two of 30g and two of 20g weight (Microwave Telemetry Inc.), all in combination with 15g VHF-transmitters (Biotrack Ltd.). Installation was backpack style (Lindlay 1998). One 30 g PTT was attached to a wild male near the I.F.C.D.W. Desert Ecology Research Station, with the remaining transmitters attached to wild breeding females. The timing of PTT transmissions was different for individual PTTs and generally they transmitted every second or third day. Six other females were tagged with VHF radio-transmitters only. AS we were not satisfied with 20 g PTT results, we then prepared two battery powered 30g and two solar powered 35g PTTs. Of these we deployed both of the solar powered and one of the battery-powered PTTs on wild birds in 1999. Wild Females were caught on the nest, using bow net installed during the evening break from incubation when the female is away feeding. After capture, weight, wing length and state of moult were recorded, samples of breast feathers and intestinal parasites taken, and a metal identification ring attached. A similar trap was used for displaying males, with dummy female is positioned as a lure. The year-round monitoring of wild male PTT No 4731 is described in the following chapter, so here only females are considered. In the 1998 breeding season, two breeding females in the Merzouga area were tagged using a combination of PTT and VHF transmitters. An additional female from the Boudnib area was also tagged in this way. Female PTT No 4730 from Merzouga (tagged on 30th March) stayed in the area until mid-April. Subsequently, she moved north-west and from 19th to 28th Aprilshe rested in the Tarda plateau before continuing west. Here, not far from the Center, she spent the following seven months. We could find and monitor her conventional signal from the small mountains around Goulmima or easyily locate here in the D.E.R.S. plateau, mostly in small vadis. This area is similar in its geology and vegetation coverage to that surrounding the plateau of the I.F.C.D.W. Desert Ecology Research Station (Peske 1998). We located the bird several more times about 2-3 km from the village. One male released from the D.E.R.S. at the beginning of 1998 now occupies the same area. In November this female suddenly disappeared and from an Argos message dated 22nd November it was clear that she had moved along the mountains 200 km eastwards to the Plains of Tamlelt. She stayed in this large plateau until the spring and summer of 1999 and during an aerial survey in April 1999 we located her there by conventional radio-tracking. Unfortunately, we had no opportunity to visit this place directly to try to verify breeding or to catch her in order to renew her PTT. From the aerial survey it was clear that the vegetation of the plain was scarce due to the lack of rains in the whole area of eastern Morocco. The last locations of the exhausted PTT were of poor quality, but until 3rd July 1999 she was still in the same place. The summer and winter feeding grounds of this female were 130km and 180km respectively from her breeding site. She spent the spring 205km away from her nest in 1998. The 20g transmitter of female PTT No 4729, (tagged on 3rd. April 1998) gave only two low quality locations in April. These were still in the Merzouga area. The transmitter prematurely expired from unknown reasons in mid May. No tagged females returned the following spring, but the weather was cold and dry with very little evidence of breeding activity of Houbara Bustards. Aerial surveys in these areas and also in the Merzouga and Boudnib plateaux did not indicate the presence of any of wild females fitted in 1998 only with VHF radio-transmitters. One PTT from the original set did not work and it was sent back to the producer to be repaired. We received it late in the breeding season. We fitted it to a female with small chicks 29th April 1998 in the south Boudnib plateau. According to the Argos data this female stayed in the same place at least until 1st July, perhaps indicating successful juvenile survival. She was consequently killed in November 1998 some 80km northeast from her breeding area and the backpack returned I.F.C.D.W. for further use. Female PTT 15130 was tagged on 9th April. This solar powered PTT is giving excellent locations and until the end of October we received over 750 Argos messages from which 25% were high quality locations (on average one everyday). This bird moved 26.4.99 to the hammada Guir on 26th April, but soon (28th April) continued towards the floodplain south from Bouanane. Here, 110 km from the nest she spent 4 weeks and moved a further 90km north to Tamlelt. In this area, close to PTT 4730, she spent the summer. In mid September she moved again to near her previous stop over in May. Female PTT 15101 was tagged 16th April. This female moved 50km on 26th April to Hammada Guir. After 22 days she moved further 40km north. 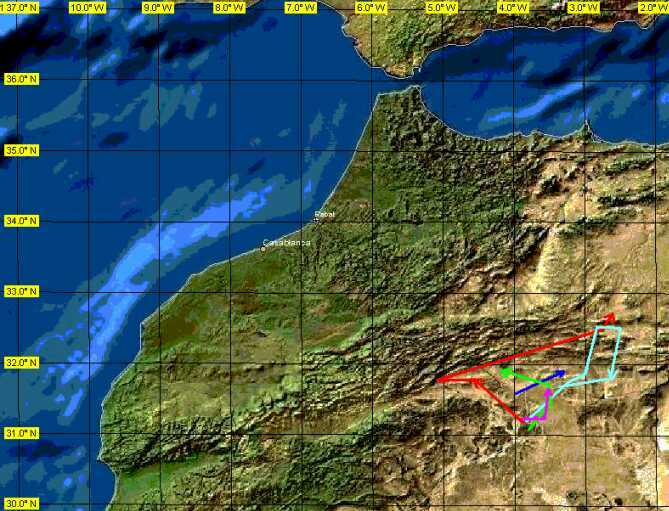 She remained in the Hammada all summer and at the end of September she flew 40 km down to the Boudnib plateau. Female PTT 3119 was caught 6th April. The last conventional signal in the area was recorded 19th April. Between 20th and 22nd she then moved, as the above birds to the Hammada Guir where she spent the summer. After six months operation this battery powered PTT suffered a sudden drop of battery voltage. Since then the data has been poor. 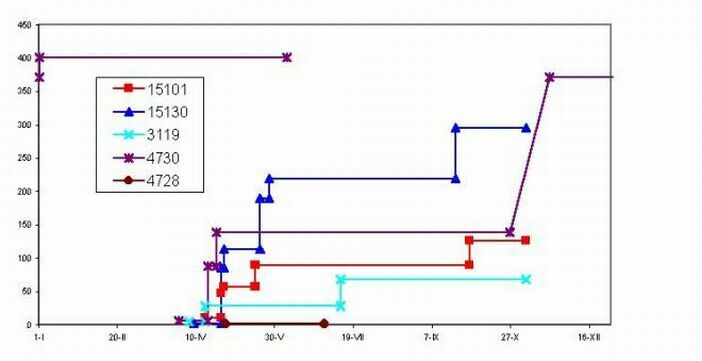 The direction of movement for all satellite-tagged females are shown in Figure 1 and the timing and distances in Figure 2. After tagging, all females stayed about two to thre weeks in their breeding area. Birds that did not re-clutch abandoned this area and by late July no tagged birds were present in their breeding areas. Monitored females from Merzouga, as well as female from the southern Boudnib plateau, moved distances of 50km to over 200km from the breeding areas. A general north-east dispersal of birds of Merzouga was noticed. During these movements, female Houbara Bustards visited new places and rarely returned to a previously visited area, although individual summer feeding grounds were often relatively small areas that were sometimes used for many months. Survival of adult birds with active PTTs was good. Until November 1999, there was only one documented case of mortality and in this case the PTT was dead and fortunately it could be recovered. The Houbara Bustard population in eastern Morocco appears to be a part of a single, dynamic unit, undoubtedly spanning both Morocco and Algeria. The dispersal range of females in particular is a conspicuous and unifying feature with regard to population structure and gene flow. The dispersal capability of young birds is also likely to be high. The importance of satellite telemetry for studying females is clear, owing to the distances moved and the absence of a clearly defined home range. This also may hold true for young birds. The pool of both sexes therefore act as more or less independent “populations” with different life strategies and perhaps lifetime expectancies; males are more sedentary but females are nomadic. It is predicted that in areas of high densitz and with low disturbance, male will form a more or less permanent network of occupied display grounds distributed in favourable breeding areas. Females move considerable distances during the year, visiting a few, temporary feeding grounds and each year they may be attracted to a different areas for breeding. Thus a male’s chance of successful breeding in a given year is strongly affected by weather conditions, as these appear to govern the movements of females. However, good breeding areas are not necessary identical to the best feeding grounds. While females may often prefer places with good spring vegetation for feeding in preparation for breeding, more barren areas may be more desirable for nesting. Further research will allow us to develop a better understanding of the behaviour of the Houbara Bustard population as a whole. This will be achieved by using appropriate procedures for studying the pool of male, female and young birds. Lindlay P (1998). Preliminary data from the release of captive-reared Houbara Bustards at Errachidia. Pp 36-43 In RJG Dawson and C Lindsay (Eds) 1998. I.F.C.D.W. Annual Report. Volume I: 1997. Peske L. (1998). Progress report from the release site at Errachidia. Pp 44-49 In, RJG Dawson and C Lindsay (Eds) 1998. I.F.C.D.W. Annual Report. Ex Post Note: In the beginning of 2000 this project was cancelled, data from remaining active PTTs lost and conventional monitoring disabled. In this year with good rains in the area many tagged females returned back to their breeding grounds used in 1998 as proved in February 2000, but their further behaviour and breeding could not be proved.